If you back up or replicate VMs running applications that do not support Microsoft VSS, you can instruct Veeam Backup & Replication to run custom scripts for VMs. For example, the pre-freeze script may quiesce the file system and application data on the VM guest OS to bring the VM to a consistent state before Veeam Backup & Replication triggers a VM checkpoint. After the VM checkpoint is created, the post-thaw script may bring the VM and applications to their initial state. 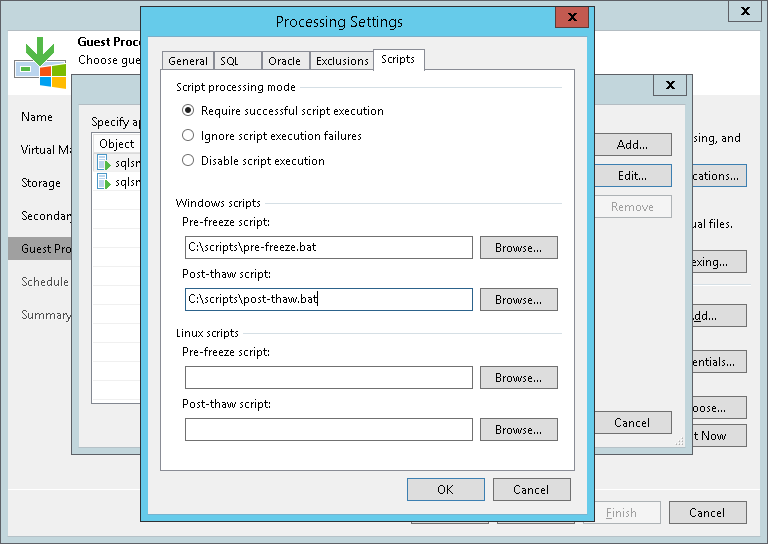 Pre-freeze and post-thaw scripts can be used for Microsoft Windows and Linux VMs. For Microsoft Windows VMs, Veeam Backup & Replication supports scripts in the EXE, BAT, CMD, WSF, JS, and PS1 file format. For Linux VMs, Veeam Backup & Replication supports scripts in the SH file format. Scripts must be created beforehand. You must specify paths to them in the job settings. Script execution settings can be configured per VM or per container, depending on the objects included in the job. When the job starts, Veeam Backup & Replication uploads scripts to the VM guest OS and executes them under the account specified in the Guest OS credentials section of the job settings. Scripts for Microsoft Windows VMs are uploaded to \\<vmname>\admin$ over the network. Scripts are executed from the C:\Windows directory. Scripts for Linux VMs are uploaded over SSH or VIX, if the SSH connection fails. Scripts are executed from the /home/<username> directory of a user that you have specified in Guest OS credentials. The default time period for script execution is 10 minutes. If the script fails to execute before the timeout expires, Veeam Backup & Replication displays an error message in the job session and error or warning messages issued during script execution. You cannot stop a job when the pre-freeze or post-thaw script is executed. If the script hangs up, Veeam Backup & Replication waits for 10 minutes and terminates the job. If you want to run several scripts that depend on each other, you must upload them to the VM guest OS manually. For example, you have script1.bat that sequentially starts script2.bat, script3.bat and script4.bat. In this case, you must specify a path to script1.bat in the job properties and upload script2.bat, script3.bat and script4.bat to the VM guest OS. It is not recommended to use the standard error (STDERR) stream for error output in Linux scripts. Veeam Backup & Replication will fail to execute scripts with STDERR.